A restful night and beautiful sweet dreams, Casa Padrino wishes you the latest duvet cover collection by Harald Glööckler, the Prince of Pompöös. The new duvet covers from the Harald Glööckler collection are just heavenly beautiful and dreamily romantic for the quiet nights for two. The material used is of the highest quality in every respect, and we guarantee that you will enjoy these luxury duvet covers for a long time. Duvet covers from Casa Padrino brings you all of this - so you can start the day active and fresh. 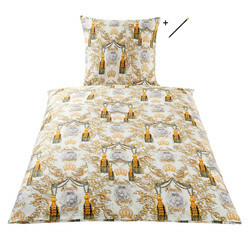 From a huge pompous selection of duvet covers you can choose your favorite copy and beautify your bedroom. Whether summer or winter, decorated discreetly or pompously - with us you are in the search for an extraordinary and extravagant duvet cover guaranteed to find.